There comes a point when everyone's garden starts to look a little overgrown. It's very exciting and satisfying when plants first start filling in, but all too soon the thugs take over, or lush simply turns to chaos. Before you run for the backhoe to tear all the plants out and start over, consider the following 18 ways to make your garden look better immediately, with a minimum of effort. 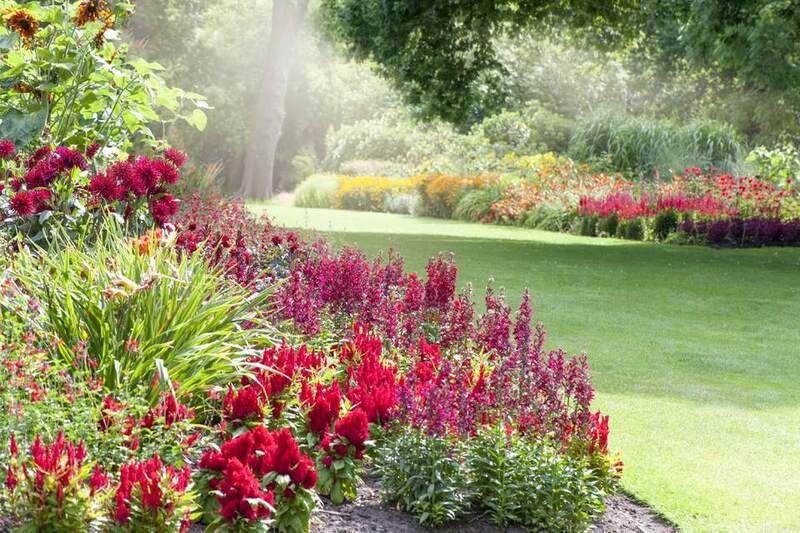 These ideas won't make garden maintenance go away, but they will help keep your garden looking good, by giving it definition. The following photos illustrate simple time-proven techniques for spiffing up your garden in the afternoon or two. This is a beautiful planting, but the distinction between garden and lawn is blurred. A clean edge would have given the border more impact. Here's a very informal border that could easily look messy if it bled right into the lawn. The edge and slightly raised bed make it clear that this is an ornamental planting and not just some plants that went wild in the corner. These garden beds were cut into the middle of the lawn. Without edging, they would look like they were floating in the lawn. With edging, they look like destinations. Closely related to edging is mulching. We know we should mulch to suppress weeds and conserve water, but mulch also serves an aesthetic purpose. If the color combination of dark soil and green leaves can make an impact with an edge, why not bring that impact throughout your garden? The darker the mulch, the more your plants will stand out. The shredded cedar mulch is a fine choice in general for mulch, but the pale rusty color doesn't do much to enhance the golden leaves of the hakonechloa grass. Edges don't always have to be cut in the soil. Sometimes it's easier to maintain if you use an edging material. 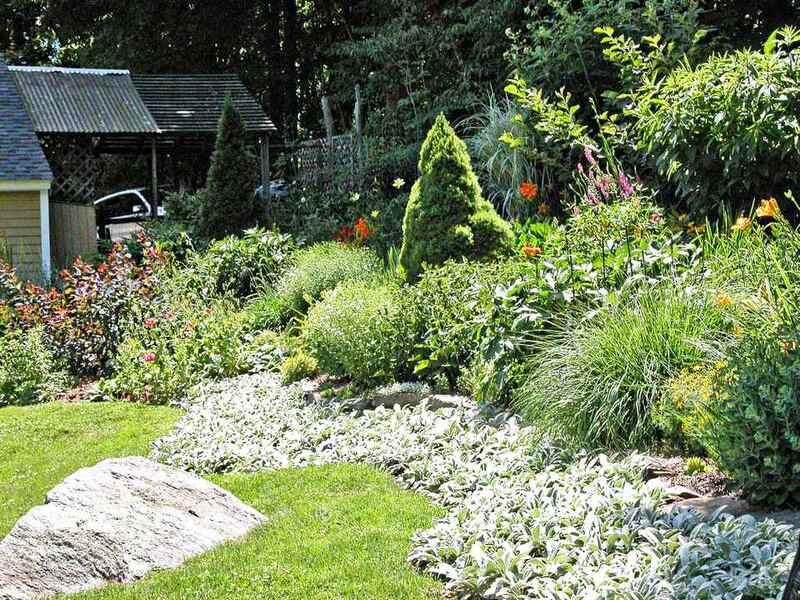 This gardener solved 2 problems by using the rocks she dug out of the soil to create her edge. The darker mulch under this corydalis not only complements the yellow flowers, but it also brings the shape and texture of the foliage into sharper focus. It's like the old gardeners trick of wetting the soil before a garden tour. The damp soil is darker and makes the greens look greener. Once again, the yellow seems to brighten when played against a dark mulch. You can see the shape and texture more clearly. If the problem is lack of structure in your garden, you should consider adding a shrub or two. Even though this cottage border is backed by an evergreen hedge, the border itself is starting to look overgrown and messy. You can't tell from this part of the garden whether the path ends or leads on, but the white flowers of the hydrangea and the large, round shrub at center both tempt you to walk out and see. Without this path, this garden would blend in with the forest behind it. It's the pair of Blue Spruces that tell your eye where to settle. Cover the spruce trees, and the plants look like a jumble. With the anchor of the spruce trees, your eye stops darting and slowly takes in the surrounding plants. When your plants start taking over and merge into a jumbled mass, you need to create a path. Even the humblest wild, woodland garden can look impressive if you care out a path. Add an object at the end of the path, and you've turned your garden into an irresistible stroll garden. This person divided her gardens into islands joined by a grass path that opens to a hidden seating area. Notice how nicely the edging defines the islands. Using shrubs in your garden borders becomes addictive. You can get just as much color and interest, with a fraction of the maintenance. This border has several groupings of perennials, but it's the shrubs that give the garden weight and age. Perhaps the easiest way to regain control of your garden is to limit the colors you use in it. This is a display garden, so the impact of all this color is intentional, but if this were someone's home border, exuberance quickly changes to over stimulation. One solution is to limit yourself to pastels. Pastels are always well behaved and work well with each other. You can still have bold, hot colors and avoid chaos if you choose 1 or 2 colors total. The red lilies are repeated down the border, creating impact and cohesion. And the orange-red of the flowers is complemented and softened by the gold of the evergreens. Another option is to choose a color and vary its shades. This astilbe will stay in bloom for a long time. Even as the flowers fade, they will be in hues that still work together to create a frame for the clematis. The Impatiens in the back corner add a pink accent. Don't forget the basics of the color wheel. Complementary colors, colors opposite each other on the color wheel, are a no-brainer combination. Think of red and green at Christmas. Blue and yellow are a favorite of gardeners. Blue flowers tend to wash out or get lost in a garden full of colors. The yellow makes blue flowers more vivid, and the blue softens the harshness of yellow flowers. So you don't need to spend weeks remapping, digging and moving your plants. Just use some ingenuity to give your gardens definition and cohesion with edging, mulch, paths, shrubs, and a limited color palette.